A critical component of the V-Go® Wearable Basal plus Bolus Insulin Delivery device is the cartridge made of Topas cyclic olefin copolymer (COC). The material can be molded with zero draft and was selected over competitive thermoplastics because of its purity, drug compatibility, biocompatibility, and dimensional stability. Photo courtesy of Topas Advanced Polymers / Valeritas Holdings Inc.
An injection molded cartridge is reported to offer drug compatibility and dimensional stability. 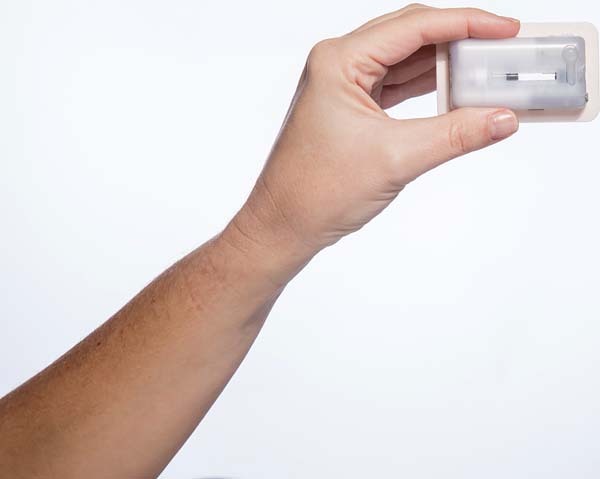 FLORENCE, Ky.–An insulin delivery device developed by Valeritas Holdings, Inc. offers patients with Type 2 diabetes a simple, affordable, all-in-one option that is worn like a patch and can eliminate the need for taking multiple daily shots. The V-Go® Wearable Basal plus Bolus Insulin Delivery device is designed to simplify basal-bolus insulin therapy and helps make blood glucose control possible for adults. V-Go is a simple, affordable, and fully disposable device that works with no electronics, batteries, infusion sets, or programming. It is small, lightweight, and worn under clothing, and is commercially available in the United States. A critical component of the V-Go's insulin delivery device is an injection molded cartridge made of Topas® cyclic olefin copolymer (COC) from Topas Advanced Polymers. After thorough research and evaluation, the material was selected over competitive thermoplastics due to its purity, drug compatibility, biocompatibility, and dimensional stability, according to Geoffrey Jenkins, executive vice president of manufacturing and research and development for Valeritas. Topas COC can also be molded with zero draft. "Topas COC fills an important role in the cartridge system of the V-Go insulin delivery device," said Jenkins in a press release. "We find it to be highly stable in contact with the drug and it has great optical clarity; moreover, it offers good injection molding characteristics with excellent dimensional stability and minimal shrinkage." Unlike other engineering thermoplastics or glass, Topas COC offers a non-ionic, minimally reactive surface. The non-polar substrate does not promote adsorption, denaturation, aggregation, or precipitation, according to Topas Advanced Polymers (https://topas.com/). Glass-clear Topas resin has very low leachables and extractables compared to glass and other medical grade polymers for drug delivery, and thus preserves long-term drug purity and enables better quality at high yields, the company said. The tube-shaped cartridge contains 1ml of insulin. Valeritas reported that users switching from multiple daily insulin shots to V-Go significantly lowered their glucose levels and reduced their insulin use by as much as 44 percent per day. The innovative V-Go® Wearable Basal plus Bolus Insulin Delivery device, designed for adult patients with Type 2 diabetes, is commercially available in the United States.